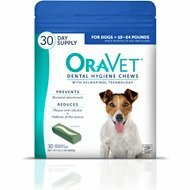 Your dog's teeth are put through challenges each day. 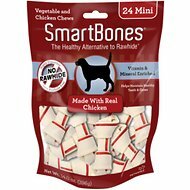 Those canine chompers have to withstand natural dog bones, crunchy dog kibble, chewy dog treats and dog toys. 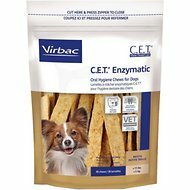 When it comes to doggie dental care look no further than Chewy. 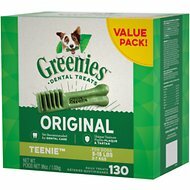 Chewy carries canine dental supplies from top brands like Greenies, Purina and Pedigree. 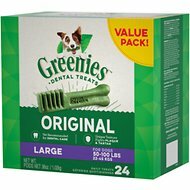 Keeping canine teeth in good shape rests on vigilant pup parents. 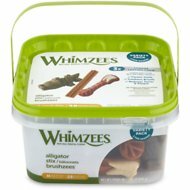 A regular dog dental cleaning is vital to healthy doggie teeth. Careful inspection from a professional during a dog teeth cleaning ensures your pup's mouth is free of harmful dental diseases. 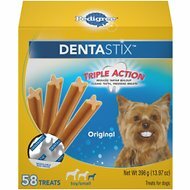 You can help your pup by brushing their teeth regularly between cleanings with a dog toothbrush and by looking to other pet dental products. 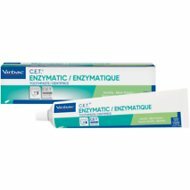 Top dog toothpaste brands like Virbac and Sentry make toothpaste for dogs that are specifically formulated to meet their needs. 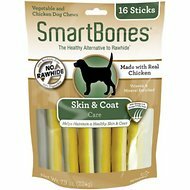 Dog toothpaste comes in a variety of flavors your furry friend will love like beef flavored oral care for dogs, chicken flavored toothpaste, seafood flavored oral care and mint dental care for dogs. 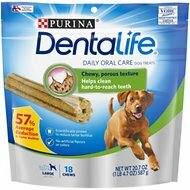 To pick the best dog toothpaste for your dog, choose the flavor of their favorite food to help make brushing easier. 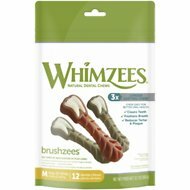 If you are finding brushing your pup's teeth impossible, try brushless toothpaste or dog dental chews. 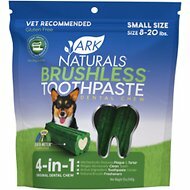 Ark Naturals breath-less brushless toothpaste cleans your pup's mouth as he chews. 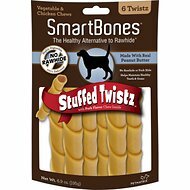 The cinnamon and vanilla flavor will leave your pup's breath smelling good enough for puppy kisses. 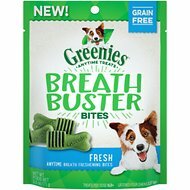 Dog dental chews from brands like Greenies, Pedigree Dentastix and SmartSticks also clean your canine's mouth while they chew. 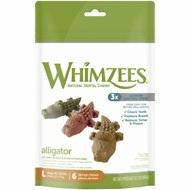 Your pup is treated to a delicious and fun-to-eat treat while the dental chews work to remove tartar, plaque and freshen his breath. 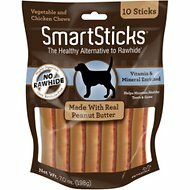 SmartSticks come in a variety of delicious dog-approved flavors like peanut butter and chicken. 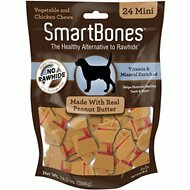 Made with real peanut butter, your cuddly companion will love snacking on these dental treats. 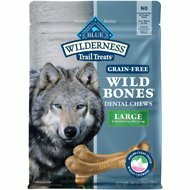 Dog dental care starts at the vet’s office with scheduled cleanings, but you can keep your pet’s teeth sparkly and gums healthy in between with our best dog dental supplements. 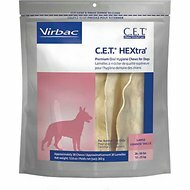 Protect your canine companion from mouth and gum disease with regular cleanings and dental pet products from Chewy.